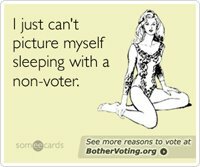 Do you know someone who may be too busy, unmotivated, skeptical, disillusioned, or sleepy to bother voting? Then put a minimal effort into changing their minds! Send them an ecard, put an ad on your Web site, or just send them to BotherVoting.org for inspiration and directions to their polling place. Partners include, someecards, 23/6, Rock the Vote, Comedy Central's Indecision 2008, Gawker, Salon, Vice, Nerve, and many others. Say exactly what you want to that special someone or anyone with a Web connection! 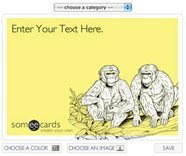 With someecards create-your-own, you can make, send and submit as many personalized cards as you like. If your card is great, it could get featured on the regular site! If not, let's maybe never speak of it again! We just launched our first set of t-shirts inspired by the cards on someecards. We'll be launching new shirts regularly. Intel "What Makes an Athlete?" This campaign celebrates hard-core gamers by treating them with the reverence generally reserved or professional athletes. The campaign examines the similarities between gamers and athletes, and positions Intel as the equipment of choice for people who want to excel in their "sport." Intel makes gaming processors so powerful that the characters in the games are starting to get depressed. Some of them deal with stress much like humans--by heading to the local pub and talking it out with their mates. Over the years the processor has become less and less important to people who are buying new computers. People buy based on price, form factor, screen size, etc. 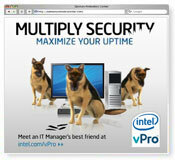 For 2007 we created a campaign designed to educate people on the benefits of a good processor, and to specifically create preference for Intel processors. For this project we worked with Christopher Guest (This Is Spinal Tap, Best In Show) to create music videos that explain the benefits of a new suite of Intel technologies aimed at IT managers. 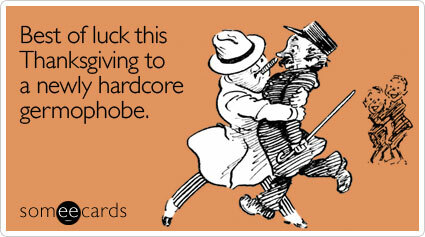 Someecards.com may or may not be the greatest thing since ecards. It's a personal project created with Brook Lundy. If drinking tequila were a sport, what would a television show dedicated to covering the action look like? In this heartwarming barroom tale a small midlife crisis is narrowly averted with a little help from an omniscient narrator. The search for la nueva generciaón of reggeaton and hip hop latino. The #1 tequila-related tourist destination in the world. 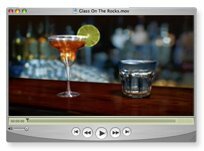 These ads were done for Jose Cuervo shortly after winning the business. The first one performed well in a Dynamic Logic study. The second one was shortlisted at Cannes. For AOL Moblie we created a site that allowed people to learn, use and buy cell phones. AOL has many applications with mobile components (mail, AIM, Mapquest, etc.). The challenge is to educate users about the availability of these apps, and to help them navigate the complex landscape this product category. To address these issues we created a customizable dashboard that allowed you to load in a phone and see what applications worked with that phone, shop for phones that worked with the applications you were interested in, and manage the settings for all these applications in one place. If you like golf, electric razors or interactive ad banners, you'll love this CNN homepage takeover (and 2006 One Show finalist). We also did ads to promote a rebate for a gift giving campaign, and a razor with a built in moisture system. 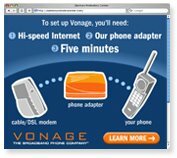 In 2005 Vonage was getting a $1000 CPA on their interactive advertising. Their direct response campaign was feature and offer based, but it didn't have a lot of personality. We created a campaign that had the same offers, but was a bit more fun, and the CPA dropped to an average of $350. 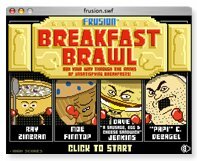 I feel confident in saying that this is hands down the best morning-meal related advergame in internet history. 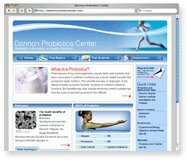 Everything you ever wanted to know about the friendly bacteria that live in your gut. It's always fun working on cool products, and over the years Sony has made some of the coolest. 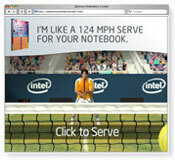 Here are some web sites and ads that we've done for them. In 2004 ING launched a site to help people get educated about managing their finances. They wanted to to make the site fun, but they didn't want to make it funny funny. Research had shown them that people don't like financial institutions to be funny with their money. In any case, these are the ads that we made to promote the fun, but not funny financial education site MoneyMentor.com. 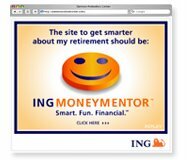 ING has a much broader range of product offerings than the public is generally aware of, and each of these products has a variety of ways in which it can be used. For this campaign we wanted to show the products offered, and we wanted to demonstrate that each of these products could be tailored to an individual's particular needs. 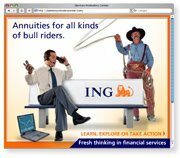 ING had a very simple promise--they wanted to be thought of as a "Fresh Thinking" financial services company. 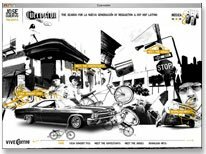 The challenge was to create ads that behaved in a fresh manner. Each of these ads attempted to do something that had never been done before in the interactive space. The first ad, Familiar, used the editorial on the page to help consumers learn how to pronounce the name of the company. The second ad, Out of Your Way, disappeared completely after introducing the brand. For the third ad, Countdown, we calculated the number of people in the U.S. who didn't know who ING was, and then set out to politely inform each and every one of them. 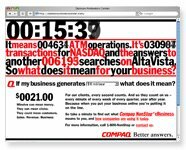 And for the fourth ad, Quotes, we built a live stock ticker that intermixed relevant quotations, based on market conditions and site placement, into the ad. 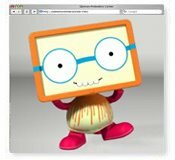 In 2003 ING asked us to create a Web site to support their sponsorship of the New York City marathon. The site we built was a celebration of the extraordinary people who run the race, and the extraordinary environment in which the race is run. It was also a great resource for getting race history, finding the best viewing spots, learning about the philanthropic aspects of the race, and simply a way to experience the marathon without breaking a sweat. This banner campaign won a Gold Cyber Lion at Cannes. 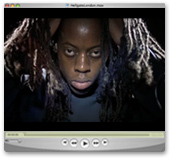 This interstitial was done in 2000, with Flash 3. It was a finalist for the One Show that year.